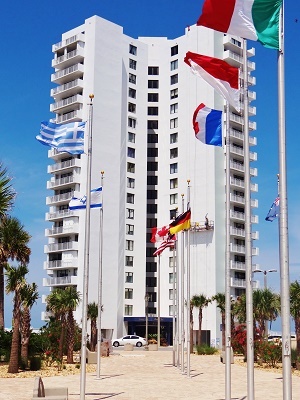 Oceans Two Condominiums are an affordable option in Daytona Beach Shores and conveniently located near the Daytona Beach Shores Community Center, food stores, banks, Walgreens and many excellent restaurants. Units provide magnificent views of the Atlantic Ocean and Halifax River with prices starting around $200k! Two and Three bedroom floor plans are available. This is a very secure building financially and structurally with an excellent association and management. This 21 floor, 108 unit complex does not allow pets and the association has a 2 month minimum rental policy.